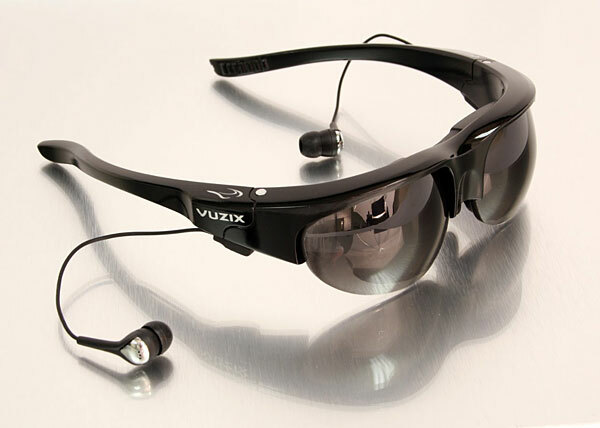 If like me you're a bit of a geek at heart and love all things to do with future technologies then you may be interested to learn that Vuzix are about to unveil a pair of video sunglasses that look almost normal! These sunglasses are able to function both as sunglasses or as a portable video display and promise to combine “virtual reality capabilities” and “augmented reality features”. The Wrap 920AV glasses should connect with almost any media player, and include built in headphones and individual focal adjustments. This technology will be great for entertainment purposes initially, but it's clear that this tecnology could in fact be used to aid our every day lives, much like the Head Up Displays used by pilots, we could potentially see this technology being picked up by car manufactures to display details directly in front of a drivers eyes. The full details including pricing won't be available until CES early next year, but Vuzix is already teasing us with this image of their Wrap 920AV video glasses. That’s awesome. Is it released into the market? I feel this is really a useful product. Model is looking very cute. I would like to have some…. please… it would be great advantage and makes riding an bike more safe, i think. espeacially with gps and a smartphone. if you could send me some spec.-papers and features. I have tried these video glasses out and was left feeling very underwhelmed, the video quality is not that great and considering the world has moved forward with 1080p HD TV’s, these feel more like I’m watching my dads very ancient 5″ portable TV. The video quality for these really need to be up to today’s standard and offer HD quality visuals. Water Repellent Eye Wear – The future?